Finished the race feeling a little less bad than last year! Was on pace for BQ until leg cramps and old age combined in a spectacular pincer movement to restore me to a more appropriate running pace. Great weather and occasional views of river and fast food! Lunch with my wife! Great support team! No Boston Qualifier. Missed Boston qualifying time by 6:41. Do not look at any pictures of me running this race. Every time I saw a camera person something was going wrong. Here are the mile Splits. Can you tell where bad stuff happened? 27 – 3:37.9 (forgot to stop watch at end of race). 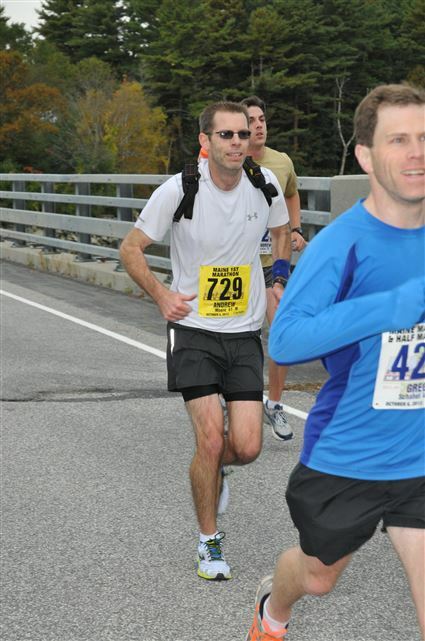 Completed first marathon (Maine Marathon) on October 6 in 3 hours 22 minutes. Beat realistic goal of 3:30, but fell short of reach goal of 3:15 needed to minimally qualify for Boston Marathon in my age group. Support was HUGE! If my family had not been along the route during the last six miles, I might have finished at a leisurely Lonesome George shuffle step, or have ditched my bib, pulled off the course and pretended to be a water-stop worker (“you can do it! almost there!.. ” I know the lines now, you liquid-pimping sadists!) until the volunteer shuttle came. Emily ran with me for a good chunk of the last mile, which was great. I anticipated being able to summon more of a conquering Caesar finish with a sprint at the end, but in true October/Halloween month marathon style, I crossed the finish line like a walking-dead zombie. Hydration and nutrition are legitimate factors. I haven’t run into leg cramps at distances up to the half marathon, but even on a cool, autumn Maine day, the marathon distance shut down both legs. I carried my own Gatorade in a nifty Orange Mud mini pack and consumed approximately 18 ounces. Apparently this is not enough, or I didn’t drink it early enough. Along with the Gatorade, I ate six Cliff Margarita chews “with 3x the salt,” and four Endurolyte capsules. I may pack a pizza and a growler of beer next time… or push an IV stand… or at least switch back to Gu’s. Heady Topper is the best beer I have ever had (put “Hints of grapefruit belong in an IPA, damn it!” on my gravestone), and I’m designating it my officially official celebratory libation for marathon PR’s, BQ’s, and maybe even DNFs. Hard to find beer, you say? Yep. Almost as hard to find as this particular Andy in a marathon, since I’m currently averaging 1 marathon every 41 years. Qualify for Boston 2015 (3:15 for lottery, probably 3:12ish to realistically get in). 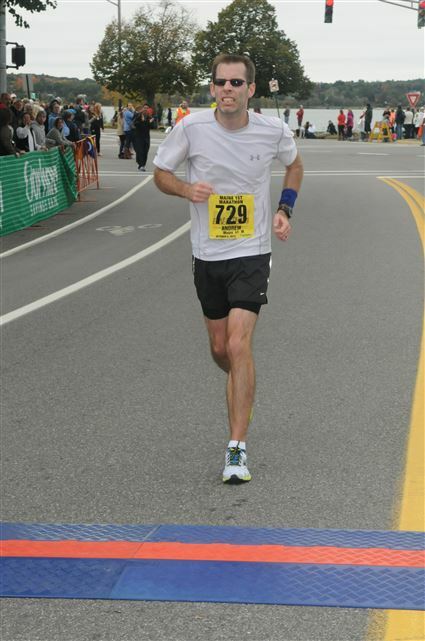 Sub 3 hour marathon in Fall. Perfect alchemy of electrolytes, fluid, food that allows me to hide what’s going on from my leg muscles. Moorezilla Enterprises LLC - Website by ADMCG.